high hardness and excellent durability make it a gemstone to be treasured. Many spinel crystals have an octahedral shape, just like diamond rough. The name "spinel" is derived from the resemblance of these crystals to thorns (spina in Latin). It wasn't until 1783 that red spinel and ruby were recognized as different minerals. The "Black Prince's Ruby" set in the center of the British Imperial State Crown is actually not a ruby, but a red spinel. Acquired by Edward, Prince of Wales (the "Black Prince") during the 14th century, this lovely spinel remains the main stone of the Imperial Crown to this day. In precious Stones (1896), the German mineralogist Max Bauer reported that spinals are "far more free from faults" than rubies, and that a one-carat spinel is worth "about half as much as ruby of equal weight," or "£5 to £7 10s." 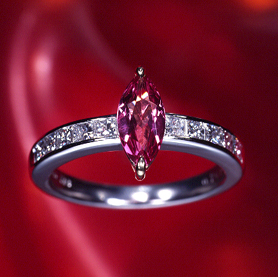 The beauty of red spinel lies in its pure red color. Because spinel is a singly refractive mineral, it does not exhibit pleochroism. The spinel on the next page (from Mogok, Myanmar), with its mosaic of light orangey-red and dark red created by its faceted cut, exhibits a balanced beauty. This spinel is a "cushion" shape (a rectangle with rounded corners); the ancient method of fashioning spinels was simply to polish the stone's surface, resulting in finished gems that closely followed the shape of the rough material, much like today's cabochon cuts. The beauty of a cabochon-cut gemstone emphasizes the fineness of the stone's color, but in the faceted styles that currently predominate, the key point is the three-dimensional beauty created by the mosaic pattern. Spinels are not heat-treated. Spinels are especially attractive in reddish colors, and they also possess high hardness and durability. So why aren't spinels as well known as rubies? The main reason is a lack of sufficient quantities for successful marketing, due to limited mining production.